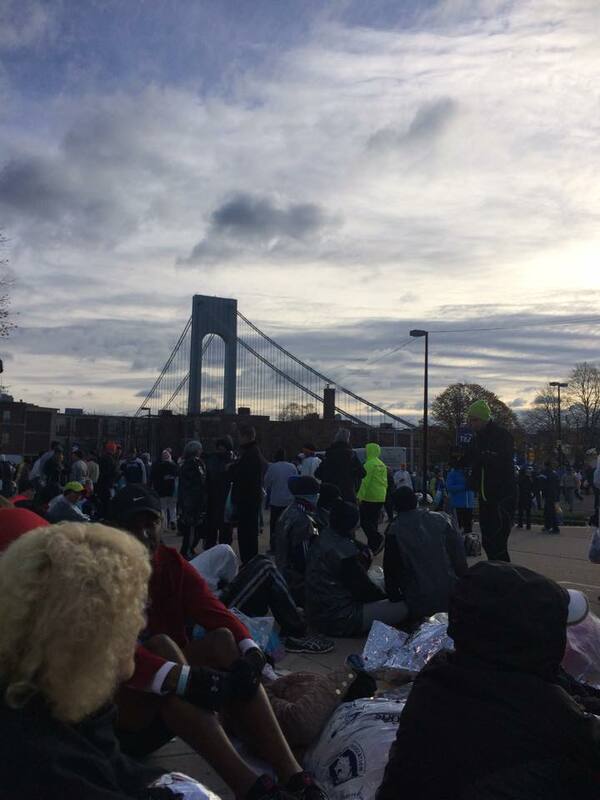 New York City Marathon– #10 is done! The weather was predicted to be bad, so I changed up my outfit at the last minute. The high was going to be 48, low in the 30s, and at race start it was in the middle-40s. I opted for arm sleeves, tights, and compression sleeves (for my legs). 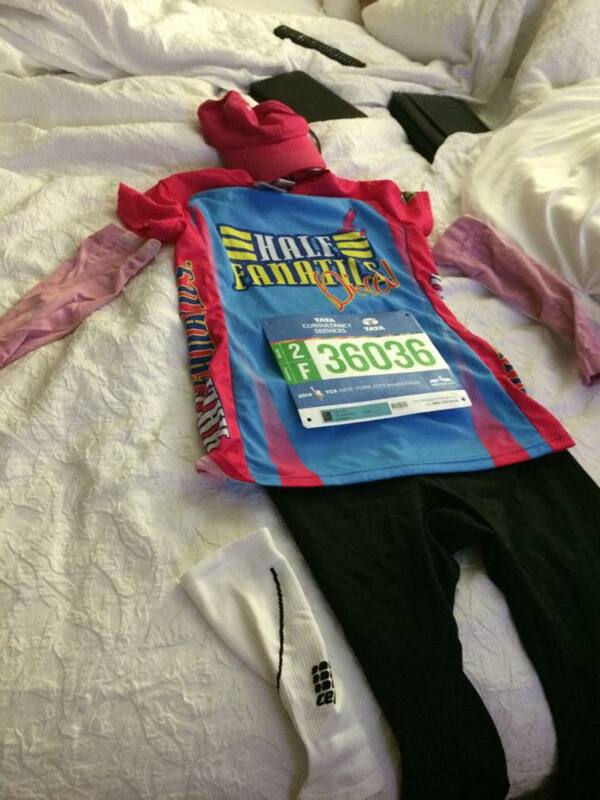 I wore my Half Fanatic shirt I earned in February. Let me start this story of what New Yorkers are really like. We walked to the Italian restaurant near our hotel in Hell’s Kitchen/South Times Square. It was cold and raining (not like Florida rain). We came upon some NYU fans that were tailgating during Saturday’s game. 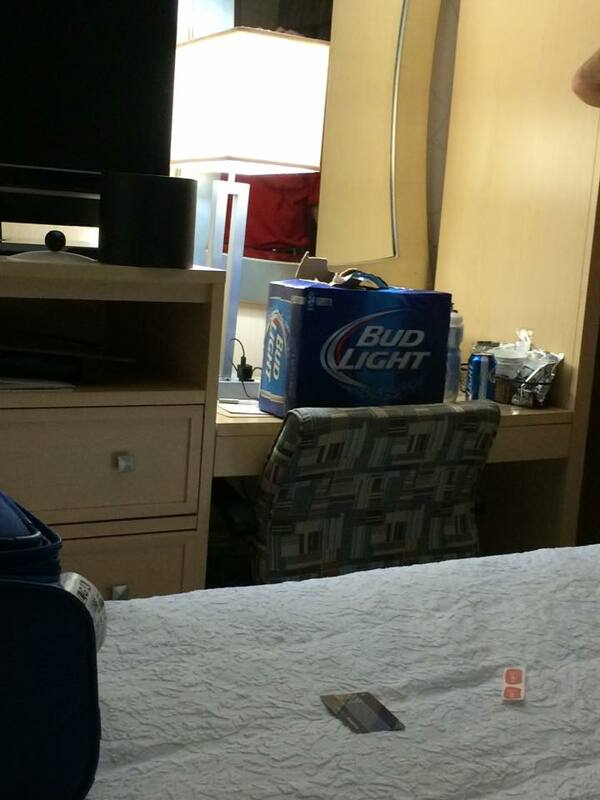 They struggled to get carry the wet 24-packs of Bud Light into a car in the Fabric District. We offered to help, being the good people that we are. In exchange for our help, they gave us a 24-pack of beer. I told them that we couldn’t accept as I couldn’t drink tonight, but they insisted it was good carbo-loading! The morning of the race, I stood for nearly 2 hours at the foot of this bridge. It was cold. About 30 of us huddled next to a diesel generator, and breathed in the foul exhaust, but hey it was warm compared to where other runners were. I had a few old sweatshirts on. It was in the 40s, with 40 knot winds. The bridge pictured is the Verranzo Narrows Bridge from Staten Island to Brooklyn. It is 3 miles long, and the 40 kt winds flew across the bridge. There were literally hundreds of hats and beanies that flew off of peoples’ heads as they ran on that bridge. It is three stories, so 50,000 people crossed that bridge to get to the other side. After you run across the bridge, you enter into Brooklyn. I heard the fans while we were on the highway, as soon as I got to mile 4, I heard them. Brooklyn-ites were 5 people deep on the sidewalk. I would give high fives to kids, only to have 6-7 more hands outstretched. The fans were wonderful. The cheering made you feel like a superstar. I understand now what sports stars feel when their fans cheer them on. It chokes me up just thinking about all the wonderful people who had sacrificed their Sunday to come cheer for us. One kid cracked me up at around mile 8, he called me “Mama-cita,” it was so cute. We made it to Williamsburg North. This was one of the oddest places I have run. Unlike Brooklyn, with full streets, there were very few people out cheering. The neighborhood was an Orthodox Jewish neighborhood. 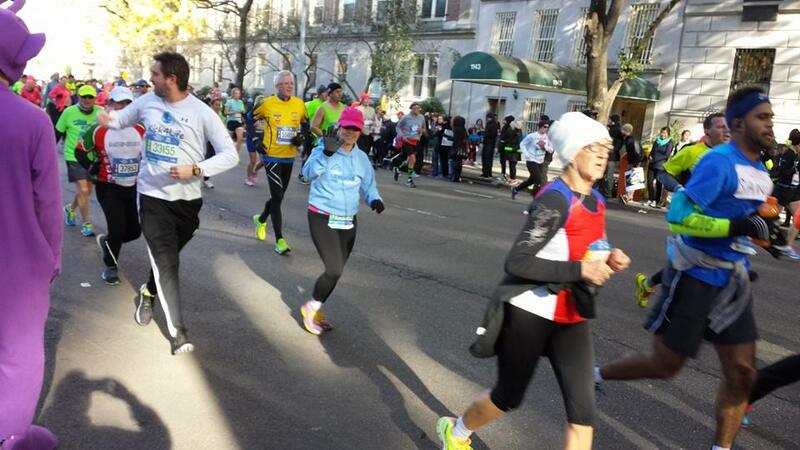 We saw Rabbis, and a few women dressed in black with their children rushing to get out of the wind, or to get away from us runners. It was so quiet comparatively speaking to Brooklyn. The signs in the neighborhood were all in Yiddish, even the signs announcing the marathon. The borough didn’t seem to really know, or understand, why we were there. I was still going strong at this point. I felt pretty good, I could feel my hip, but it wasn’t bad. 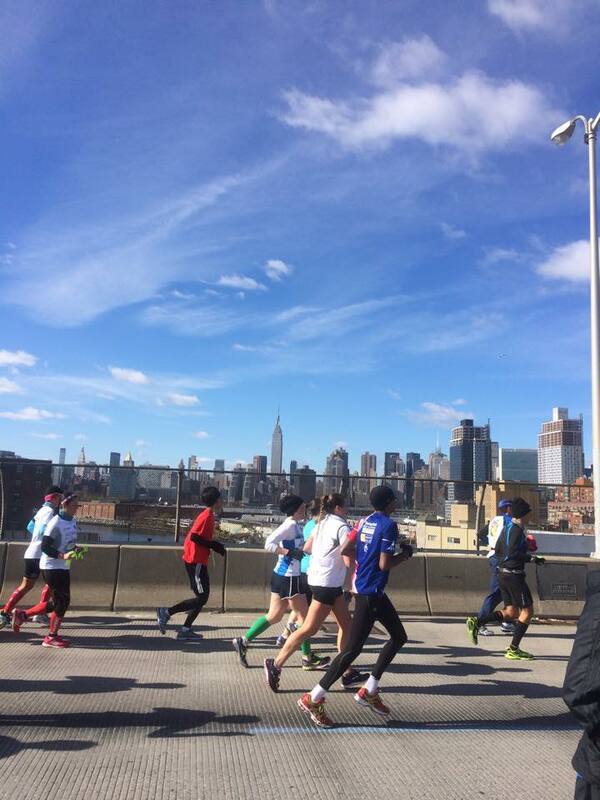 We got to mile 15, and was informed by the volunteers that we were about to hit the Queenboro bridge, and there was no water stops on the bridge. This bridge had multiple stories, we were running along the bottom story, and I lost my GPS signal there. I had to stop and get a picture of Manhattan as we crossed the Queensboro bridge. 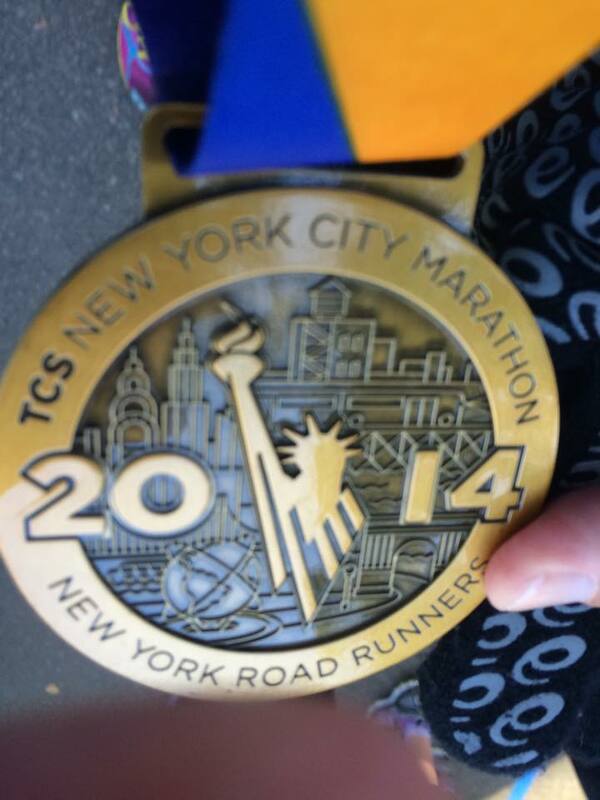 I still felt good at mile 15-16, while we entered into Queens. I was starting to feel sore at around mile 19, and mile 19.5, I had to stop and walk. I was at around 3:30 hours at this point and new that if I walked, I would finish around 5:30. It was hard to walk, I had wanted this to be my best time, but I decided that it was better to finish and have pride that I finished the race, than to push it, and maybe get a DNF at mile 20. At mile 21, I saw Shane for the first time since he had dropped me at the bus stop at Bryant Park. He said I looked cold, I was cold, so he gave me a sweatshirt to wear. This inspired me to run. I started to run, and Shane sprinted ahead of me for a few miles to get pictures. 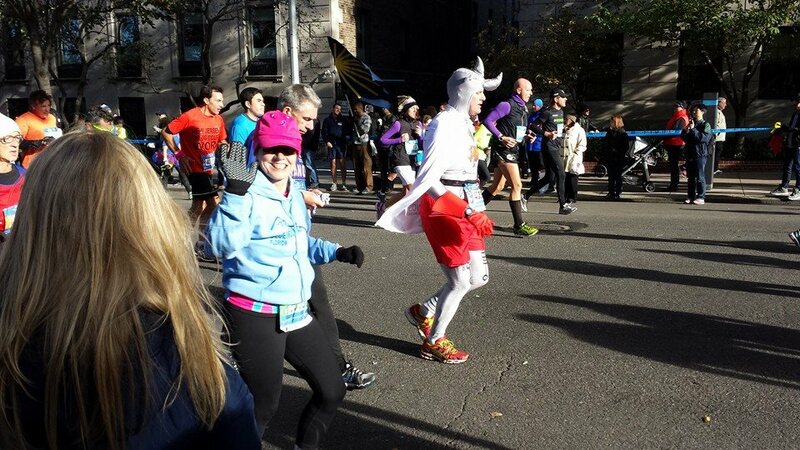 We were separated for a time while I ran through the finish in Central Park. 5 hours later I got this! We walked about a mile to get out of the finish line. It took me about 45 minutes to find Shane again, and we walked back to the hotel. I was cold, sore, and tired. During marathon night I felt well enough to walk to 30-Rock, and ate at one of the best steak-houses in the United States. We enjoyed a 5-star meal, and a tour of Rockafeller plaza. It is amazing that a few days after we left the tree arrived. During our 5-day tour of NYC, I took over 1,000 pictures, that I am still going through to this day, and I look forward to sharing those with you. We came home from New York completely fried. I have yet to unpack. I went to the doctor, because the injury was making me nervous. The good news is that this is not sciatica issue, and that it’s probably a pulled muscle due to over-compensation. The bad news is that the injury is related to plantar faciitis. I will be off my feet for a few weeks, until my muscle straightens itself out. I’m already signed up for my next half-marathon and marathon. I will be running The Biggest Loser Half Marathon in Panama City over Christmas, and 26.2 With Donna in February.